The inflation rate, however, remained within the Reserve Bank of India’s (RBI’s) overall target range of 2-6 per cent, prompting economists to expect another 25-50 basis points’ cut in the policy rate by the monetary policy committee in 2019-20, though not in the next policy. The food inflation rate rose to 0.30 per cent in March after witnessing a contraction in the past five months. In February, the food deflation rate stood at 0.73 per cent. This pushed up the overall inflation rate, from 2.57 per cent in February. The core inflation rate (inflation rate sans food and fuel), meanwhile, fell to 4.97 per cent in March, from 5.36 per cent in February. Within food items, vegetables, fruits, pulses and sugar remained in deflation in March. Elsewhere, CPI inflation fell in March compared to February, except for in health services. For instance, clothing saw the inflation rate coming down to 2.49 per cent from 5.58 per cent. Similarly, the inflation rate in rent, calculated for only urban areas, fell to 4.93 per cent from 10.07 per cent, while fuel declined from 6.84 per cent to 2.42 per cent. 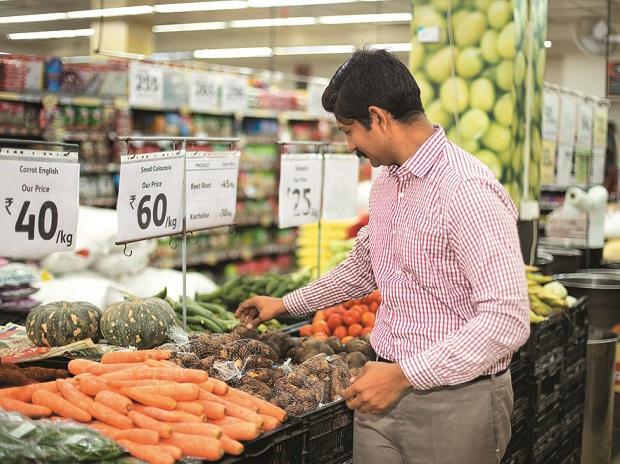 Devendra Pant, chief economist at India Ratings, said inflation is likely to remain benign till the third quarter of financial year 2019-20 and may breach the 4 per cent mark in the fourth quarter. Only household goods and services witnessed the inflation rate rising to 6.05 per cent in March from 3.80 per cent. Within this category, the inflation rate in health rose from 5.89 per cent to 8.86 per cent. There were some issues related to calculation of inflation in health, and economists remained suspicious of the figures. Sujan Hajra, chief economist and executive director at Anand Rathi Shares & Stock Brokers, said inflation, despite hardening, remains extremely benign as compared to the longer-term trend. “So we expect the RBI to continue with the neutral rate and accommodative liquidity stance. We expect 25-50 bps rate cut in 2019. However, after two successive cuts, the RBI may pause in the next policy,” he said. B Prasanna, group head, global markets – sales, trading and research at ICICI Bank, said further rate cuts, though not ruled out, would be data dependent based on clarity on food and fuel trajectory, fiscal situation and some indication of transmission of the twin rate cuts. The average food inflation rate fell to the lowest in 2018-19 since India undertook a seachange of economic reforms in 1991. “The food inflation rate of 0.14% in 2018-19 was the lowest since 1991,” D K Joshi, chief economist, Crisil, said. The CPI inflation rate has been there since 2011-12. Before that, Joshi took food inflation figures for CPI-industrial workers into account for comparison.